2nd attempt: Way too generous until one can't see the noodles! This is one of the most famous noodles of Seremban. I had my first taste of it more than 15 years ago. And when the idea of MFF was concieved, this was the first thing I wanted to cook for Negeri Sembilan. There are a few places to eat this in Seremban and the most popular was the one at the Wet Market. I tried to replicate King's version of Beef Noodles. I've eaten it once and I remember it doesn't taste like the pasar version at all,(courtesy of Hody who brought it to me all the way from Seremban). Frankly, I don't quite like the pasar version that doesn't taste of spices.It was very garlicky and shalloty (haha, no such word, right? ), and I could smell the dried chilli in the light broth of which is quite a put off (personal opinion only, some of you may like it). King's version has more spices and was rather pungent, something that is definitely preferred by me. I consulted two fellow bloggers who are from Seremban and they helped me on the replication work. Reese gave me a very good description of the beef jerky and it came out well. Hody helped me test the recipe by cooking it. 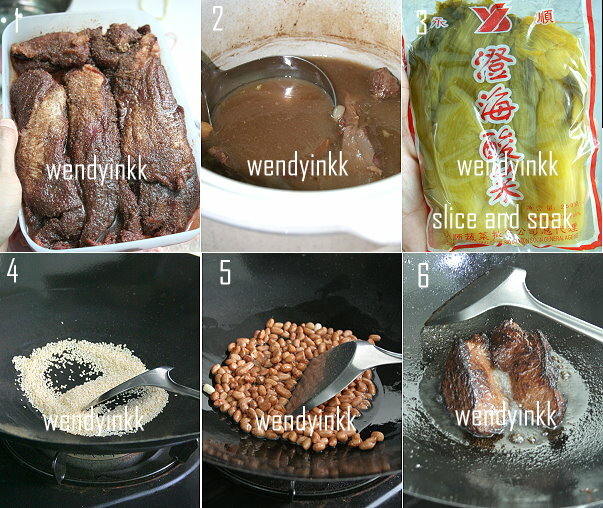 Hody can't cook beef at home, so she used a combination of pork and mutton. Without the help of these two fellow friends, this recipe might not come about so easily. This wasn't the first recipe that I cooked. Actually I cooked it 3 times. And so the pictures you see today are from 3 attempts. I don't think I'll cook this anymore, definitely not in 2013 again! The first attempt and second had 15 spices in it, and it seemed hard to believe, LOL. I'll keep that recipe if one day I want to start a noodle business. I cooked it a 2nd time and brought them to my brother's place for them to try and most of all, give me feedback. My 2nd SIL tried it and told me, she kept thinking and thinking about it. My eldest brother (he stayed in Seremban for a year and ate at Kings many times) said it was almost like it, but he also can't remember exactly. They were just eating and eating to their tummy's contentment. I was a bit hesitant to post the recipe with 15 spices, due to personal disbelief. LOL. So, I tried again for the 3rd time with lesser spices, the few spices that usually works with beef. Almost like it, less pungent only. Not as good as the first version, but more realistic. I'm not sure if this is on the spot, but, from the looks of it, does seem similar, hahaha! I'm just trying my best to replicate and it's been many years since I last had it. If I could get it exactly, then so many others will be selling similar tasting beef noodles, right? Hody told me, every stall in Seremban tastes different. So, it's ok! I wrote the workflow based on my own experience, minimizing time wastage. 1. Marinate beef jerky. Cut beef into 1 inch thick slices. Combine the seasonings and sprinkle it over the beef. Pat the seasonings in. Keep it overnight in the fridge. 2. Soak rice noodles (if using dried ones) in tap water. 3. Prepare beef broth. Rinse the larger spices and put all of them into a spice pouch (if you have). Fill up a pot with 1.5L of water. Bring to a boil and then put in beef and beef tripe (don't cut). Put in salt and soy sauce and bring it back to a boil. Lower to a simmer for 2.5 hours. 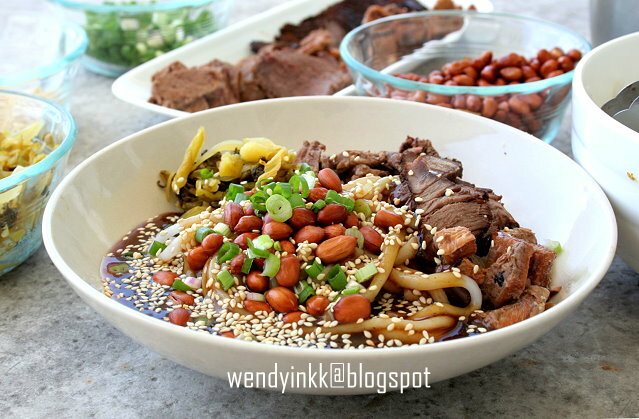 Strain the broth and remove beef brisket and beef tripe**. Leave aside to cool and slice thinly. Make sure you have at least 1L of beef broth, if not, add more water. 4. Meanwhile, wash pickled vegetable. Slice it thinly and soak in water for at least 1 hour. Squeeze and change water twice in between. 5. In a clean dry wok toast sesame seeds until golden and puffy. It might start to jump. Dish up and set aside. 6. On medium low heat, put in ½ cup oil. Put in peanuts and lower to low heat. Slowly fry the peanuts until the nut inside takes on a light golden beige colour. Takes about 5-10 minutes. Dish up and drain on paper towels. 7. With the same oil in wok, fry the marinated beef (keep the marinade), using low heat. Fry the beef until the meat no longer feels spongy, but firm. Dish up leave to cool. Slice to thin slices. 8. With the same dirty wok, don’t discard any oil in it. Pour the remaining beef marinade in and cook it until it looks bubbly and fragrant. Pour all the strained beef broth into the wok. 9. Add in vinegar, Add dark caramel sauce (as dark as you like it). Taste it, and adjust as needed. There should be a very very mild sourness, slightly oversalted and mild sweetness. 10. Pour in tapioca starch mixture (might not need all) and thicken to the consistency of “sharkfin soup”. Pour gravy into a small pot with lid to keep until serving time. 11. Wash wok clean. Squeeze the pickled vegetable dry and dry fry it on the wok until it feels dry. Dish up and set aside. Place some noodles into plate/bowl. 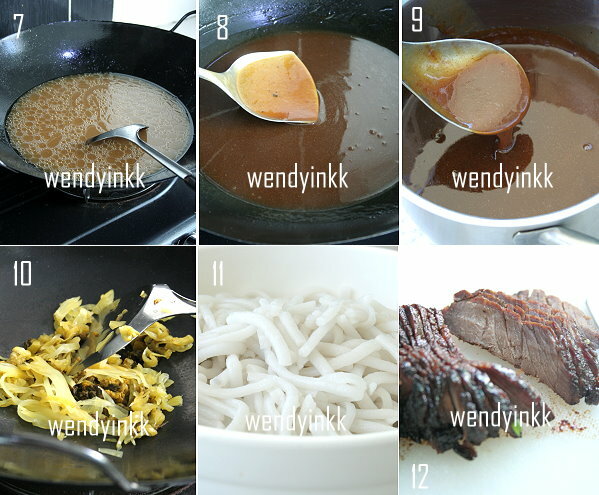 Place beef slices onto noodles, then ladle some gravy on it. Top with pickled vegetables, peanuts, spring onions and sesame seeds. *Take note that the beef tripe shrinks to about 25% of its original size after cooking.So, it's not a lot. **If you want to remove the tallow (beef fat) from the broth, let the whole pot of broth cool down to room temp, the tallow will solidify. Ladle the top layer of broth and strain it to remove the tallow. Just discard the solid fat. Of your way too generous until can't see the noodles....how much would you charge for that for a bowl? hee....hee... because I would like to order one bowl from you now. Previously here there is a stall in JB, one bowl cost $8 (without the peanuts). But the owner has retired since. So I think I got to cook this myself using your recipe now.. Thank you for sharing! Mmmmm.... I like the look of the thick gravy. 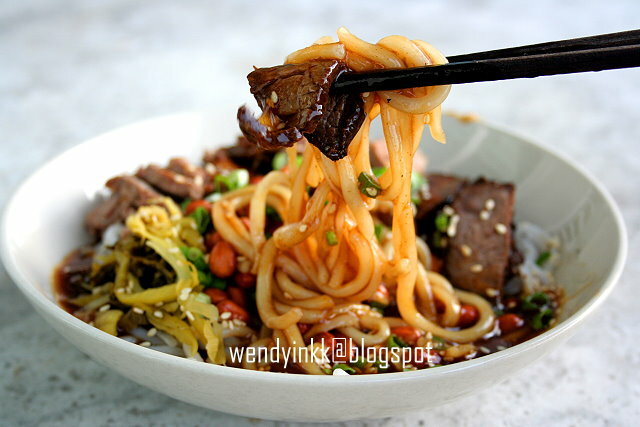 There are so many interesting beef noodles around the world! Shall try this if time permits. how to make beef broth? thank you Elin for the compliments. I will go full throttle for Perak month in support of you, hahaha! This one, u do one time, eat whole day, hahaha! see the picture, air liur pun sudah keluar, give me one bowl please..
the seremban version looks so different from the normal soupy ones here..looks quite rich to me and delicious looking!do they normally serve with lai fun? looks like too complicated for me liao hahaha... but the noodle looks so delicious. 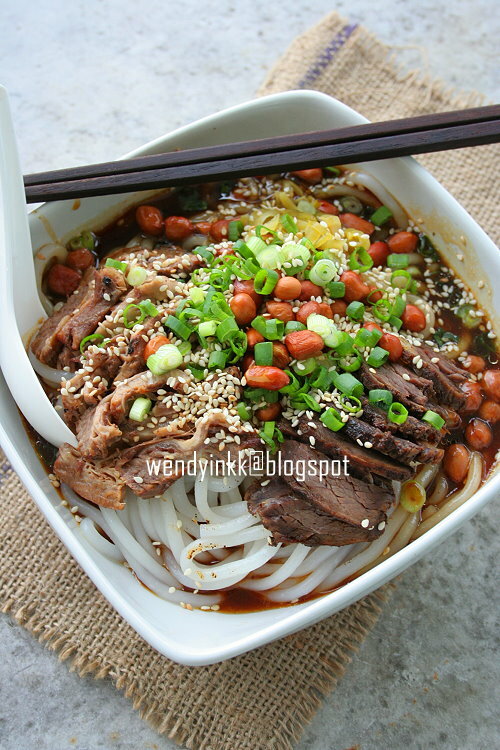 i love HK's beef noodles so I should love this even more since its full of spices which i love...looks so good! I'll give u 5! One for everybody at ur home. Yes, laifun is a must. This one no lobak, the taste will be different :) HK ones have lobak? This is another of our family favorite hawker food in Seremban, but its very tedious to DIY ourself. I really 'tar piak' (salute) lo.... Wendy Boleh!!!! 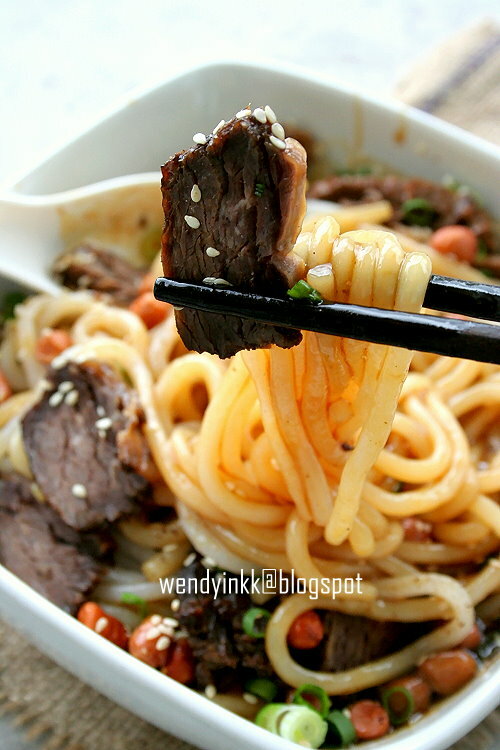 Salute... :) Seremban Beef Noddles also can DIY. I stayed in Seremban, and i likes this noddles alot. Look at the ingredients and steps... i really think i should go "tabao" only. Thank you for sharing this recipe. 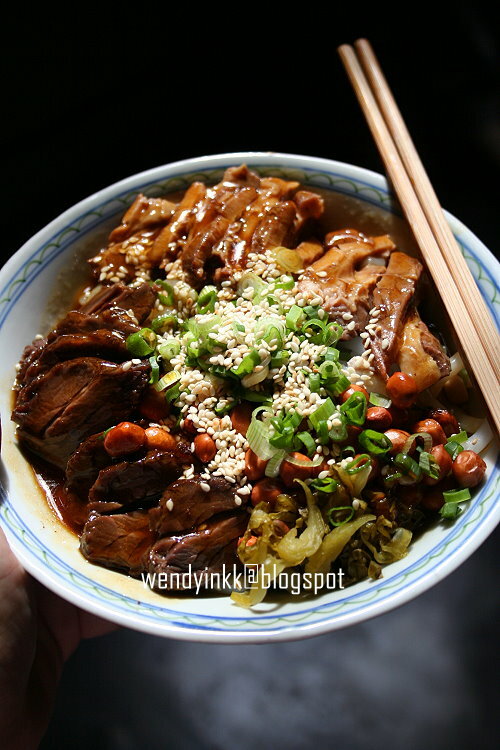 Seremban beef noodles is one of my favourite foods and it's so hard to find in KL/PJ. I will definitely attempt to make this at home now. Thank you! OMG!!! 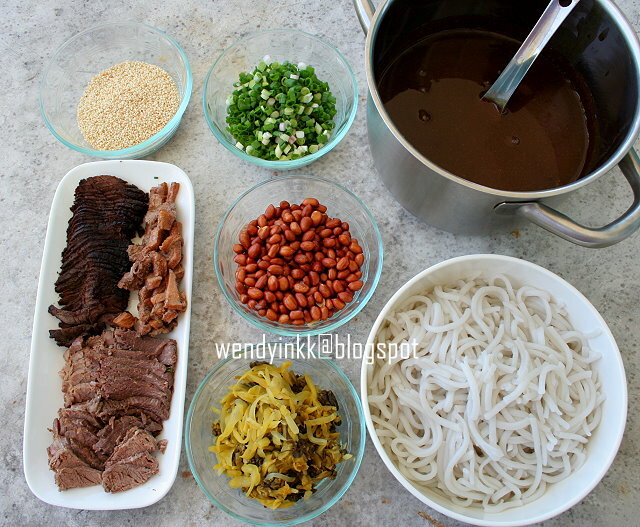 I miss Seremban beef noodles so much and I am definitely going to try out this recipe. Can't find a good beef noodle in JB.